This image was taken from Mikroskoopische Vermaaklykheden (Microscopic Delights of the Mind and Eye), a Dutch edition of a book written by the German microscopist Martin Frobenius Ledermuller (1719-1769) in 1760. 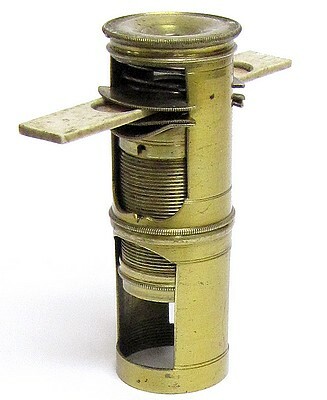 It shows a solar microscope screw barrel combination. Extracted from: A System of Natural Philosophy, by J. L. Comstock, 13th Edition, 1834. 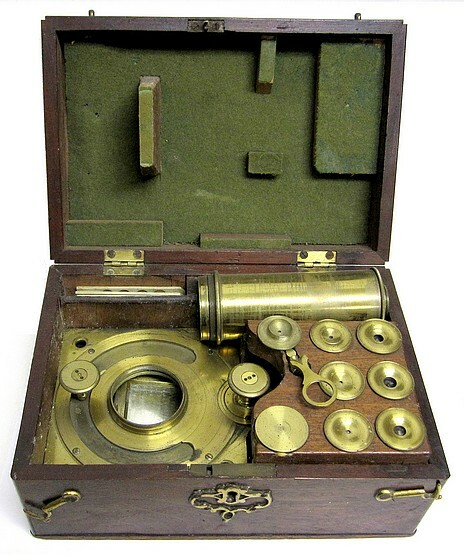 The Solar Microscope consists of two lenses, one of which is called the condenser, because it is employed to concentrate the rays of the sun, in order to illuminate more strongly the object to be magnified. The other is a double convex lens, of considerable magnifying power, by which the image is formed. 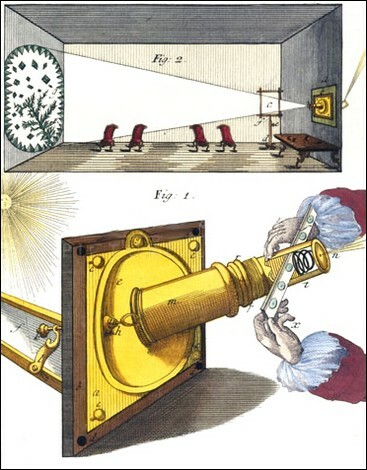 In addition to these lenses, there is a plain mirror, or piece of common looking-glass, which can be moved in any direction, and which reflects the rays of the sun on the condenser. The object a, fig. 168, being placed nearly in the focus of the condenser b, is strongly illuminated, in consequence of the rays of the sun being thrown on b, by the mirror c. The object is not placed exactly in the foc. of the condenser, because, in most cases, it would be soon destroyed by its heat, and because the focal point would illuminate only a small extent of surface, but may be exactly in the focus of the small lens d, by which no such accident can happen. The lines o o, represent the incident rays of the sun, which are reflected on the condenser. When the solar microscope is used, the room is darkened, the only light admitted being that which is thrown on the object by the condenser, which light passing through the small lens, gives the magnified shadow e, of the small object a, on the wall of the room, or on a screen. The tube containing the two lenses is passed through the window of the room, the reflector remaining outside. In the ordinary use of this instrument, the object itself is not seen, but only its shadow on the screen, and it is not designed for the examination of opaque objects. When the small lens of the solar microscope is of great magnifying power, it presents some of the most striking and curious of optical phenomena. The shadows of mites from cheese, or figs, appear nearly two feet in length, presenting an appearance exceedingly formidable and disgusting; and the insects from common vinegar appear eight or ten feet long, and in perpetual motion, resembling so many huge serpents. The microscope can be used either as a solar microscope or as a hand-held screw barrel microscope. 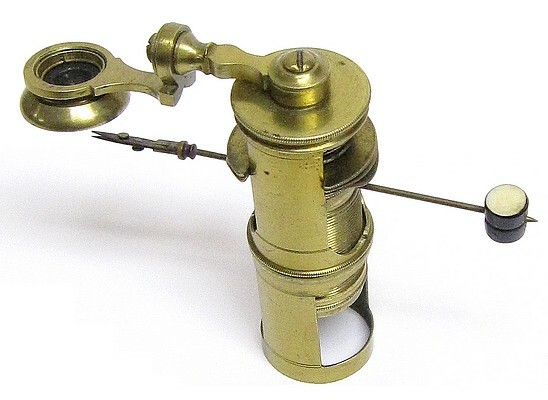 Among the accessories are six numbered objectives, another objective with Lieberkuhn reflector, a specimen forceps for use when the microscope functions as a hand-held screw barrel microscope, the extension needed to mount the objectives when using the forceps. 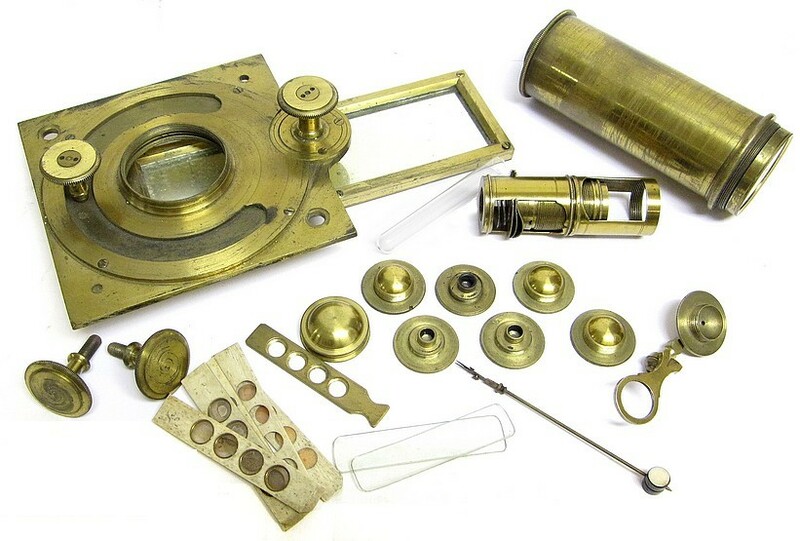 parts of a wet slide, a glass tube, three ivory sliders, and the two brass screws for mounting the solar microscope to the wall. 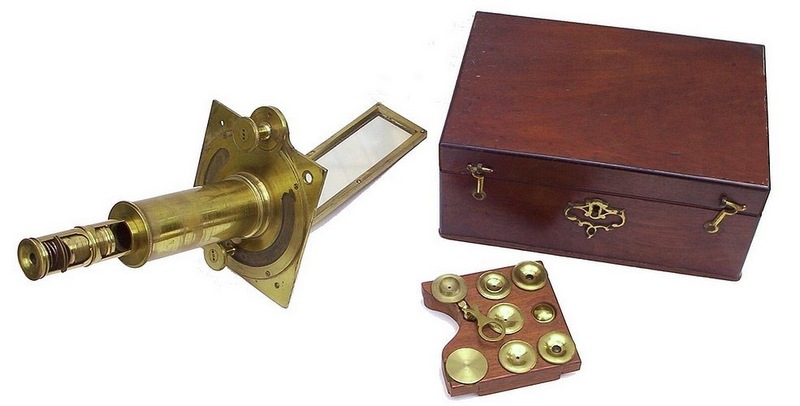 In the Harvard collection is another solar microscope (inventory No. 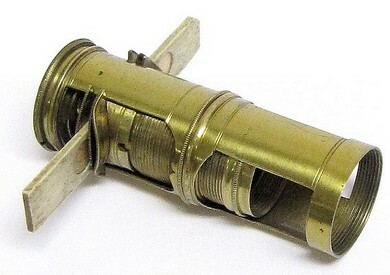 1169) with a screw barrel dated c. 1745. 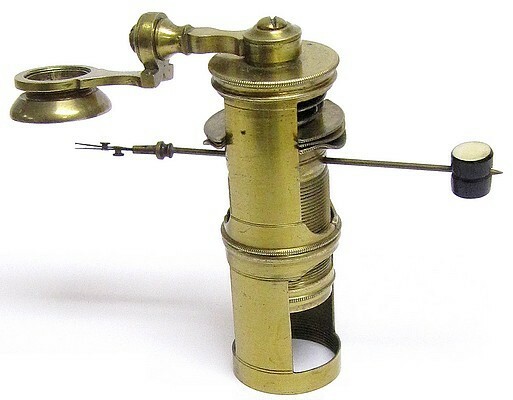 In the online description, it is stated "This application of a screw-barrel microscope to a solar microscope was allegedly the idea of the Edward Bromfield"
Another solar microscope by George Adams having screw barrel and a similar case and layout recently sold at auction (Bonhams, Instruments of Science & Technology, including Cameras 4 Apr 2017, lot 65).